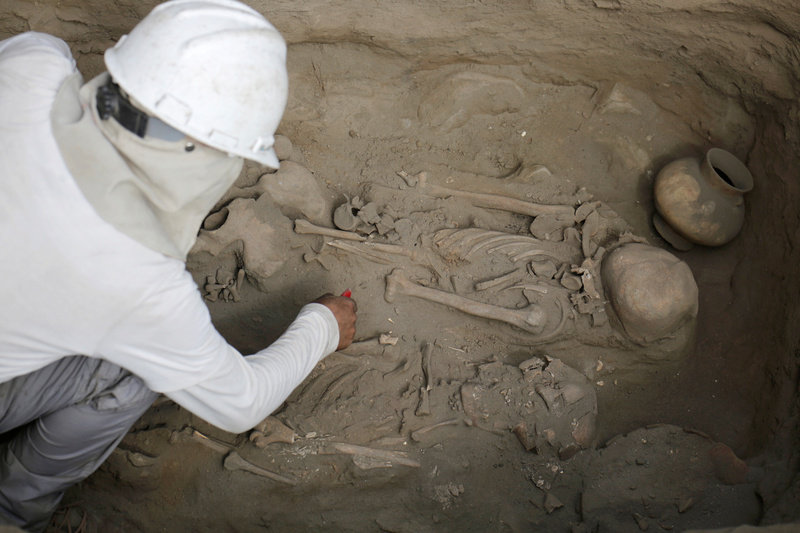 Archaeologists excavating in the Huanchaco district of Trujillo, northwestern Peru, have discovered 77 tombs of the Chimú civilisation containing the remains of 47 individuals, including 12 children and one neonate believed to have been ritually sacrificed. Fractures in the ribs and cutting marks on the thorax of the children suggest attempts were made to cut their hearts out, likely as a sacrificial offering. One of the children was wrapped in a cloth and buried with 39 spondylus shells, warm-water molluscs that the Chimú are believed to have associated with the arrival of the rains. Bringing precipitation to the north coast may have been part of the religious purpose of the sacrifice. 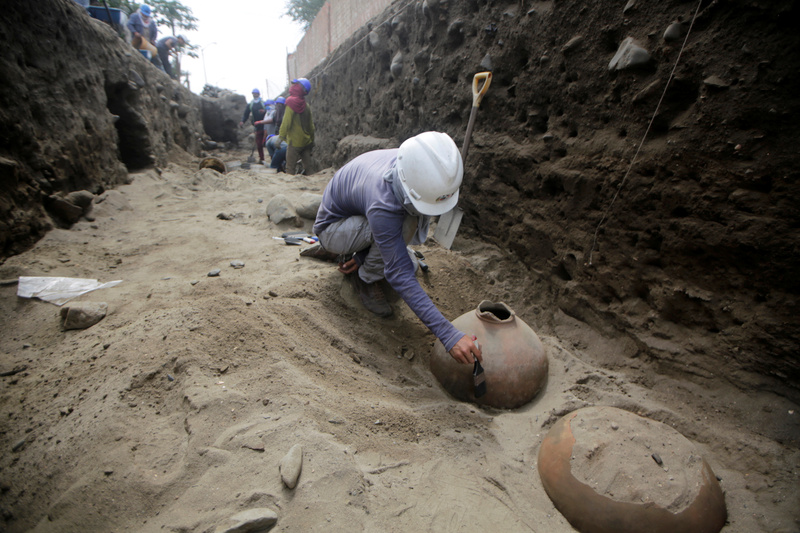 Also found in the burial ground were the remains of 40 camelids, 115 Chimú pottery vessels, metal artifacts and fishing tools. 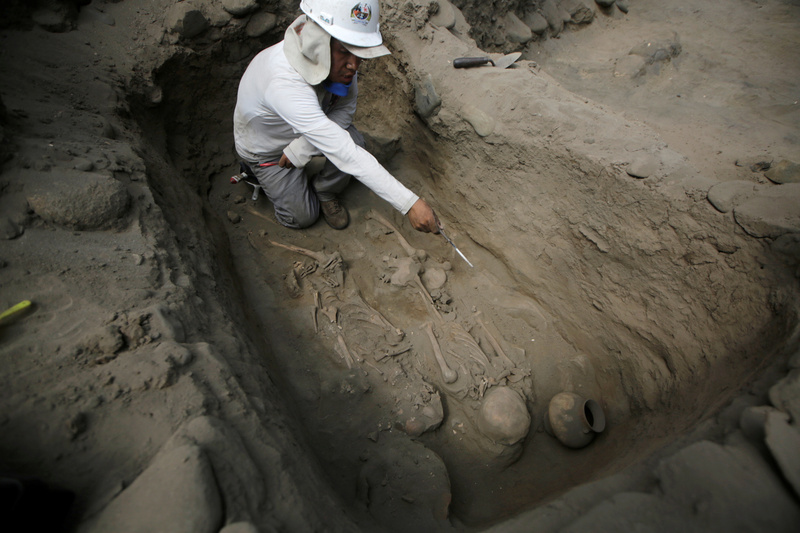 The graves date to around 1,200 to 1,400 A.D., the later centuries of the Chimú culture which ruled the northern coastal area of Peru from around 850 A.D. until they were conquered by the Inca in 1470, shortly before the arrival of the Spanish. 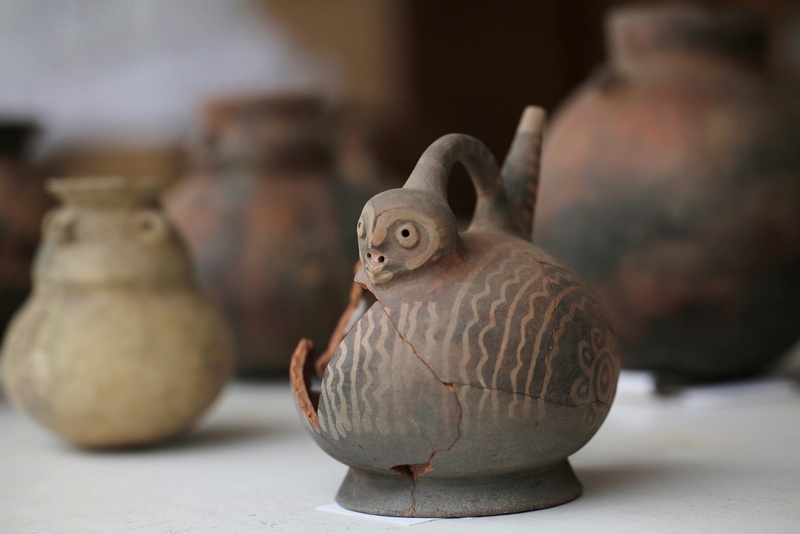 It was heavily influenced by its direct predecessor, the Moche culture whose decline overlapped with the rise of the Chimú, and some of its crafts (textiles in particular) suggest the influence of the even more ancient Wari culture. Their greatest urban center was Chan Chan, 2.5 miles northwest of Trujillo, the capital of the Chimú empire of Chimor and the largest city in pre-Columbian South America. Its estimated population at its peak was 40,000-60,000 people. Today it is an archaeological site approximately eight square miles in area with more adobe buildings than any other city in the Americas. It is the second largest grouping of adobe structures in the world. Huanchaco, about 2.5 miles from Chan Chan, was its main port, as it was for the Moche before them, the Inca after them and for Spanish Trujillo after them. It’s also the place where ceviche was invented and long may it be blessed for having gifted this delicacy to the world. Pottery fragments and fishing weights, hooks and needles from earlier cultures — the Salinar (400-200 B.C. 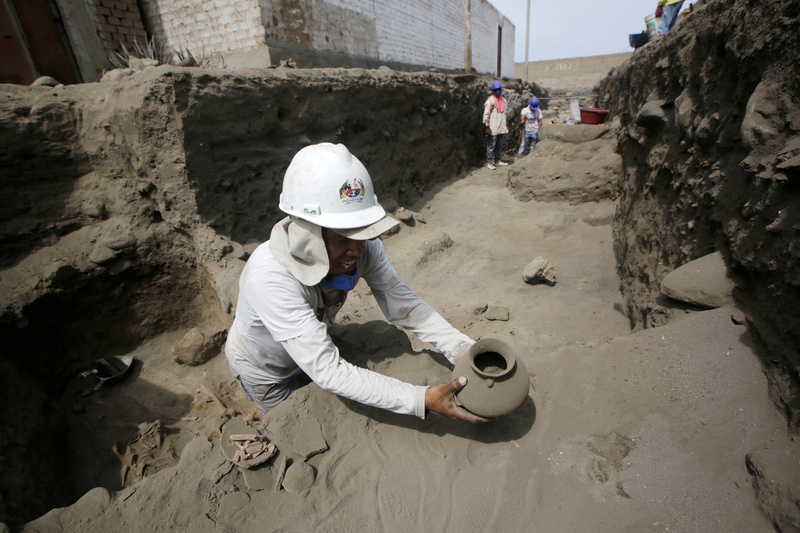 ), Virú (150 B.C.-500 A.D.), Moche (600-700 A.D.) — were found at the burial site as were the remains of ancient structures, evidence that the neighborhood was an inhabited urban area for a thousand years before being abandoned. The Chimú residents of Chan Chan later converted it to use as a location for burials and associated rituals. The excavation is an archaeological rescue project to salvage historically significant material in advance of an expansion of potable water and sewage works. So far the dig has uncovered an area of 3,200 square meters (.8 of acre) over eights city streets. 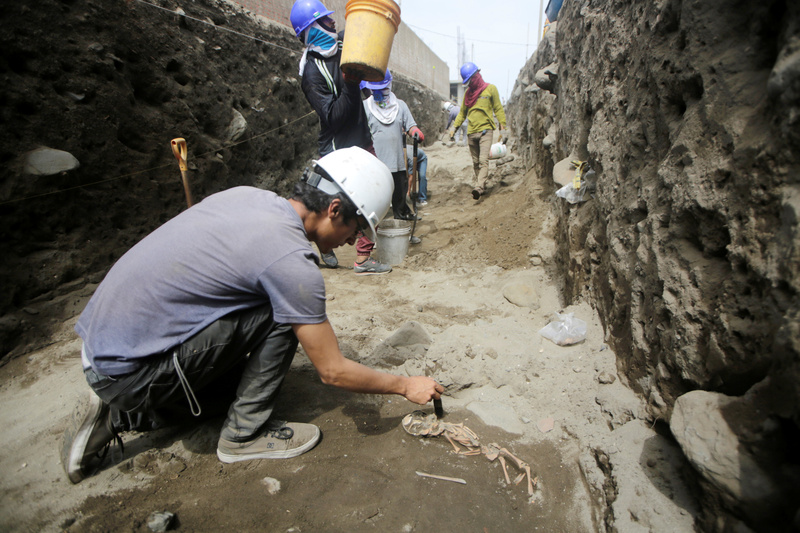 By the time the excavation ends in June, that figure is expected to double. Once whatever can be recovered is recovered, the city will request a Certificate of No Archaeological Remains (CIRA) and the water and sewage works will go forward as planned. For now the archaeological material is being stored in a rented house in Las Lomas, the neighborhood where the excavation is taking place. 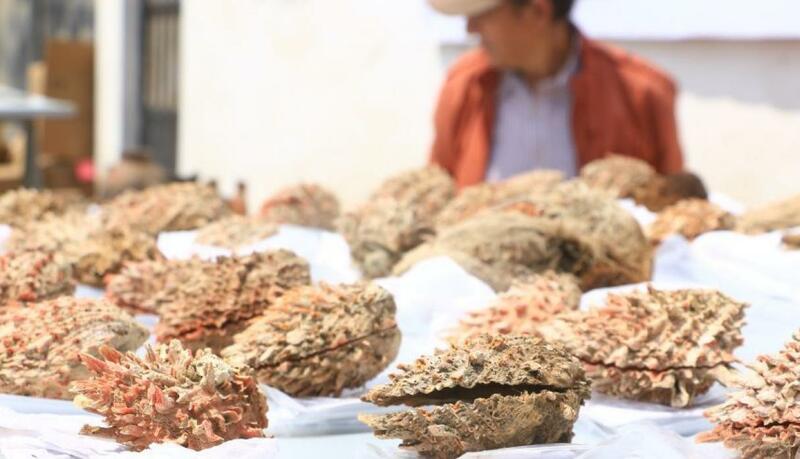 Some of it will be transported to the National University of Trujillo (UNT) for conservation and further study. The city hopes to raise funds to build a museum close to the find site where the discoveries can be exhibited and secured in proper conservation conditions.